This story, by an unknown author, was circulated years ago. It is likely fictional, as many such stories are, but think of it as a parable. A store owner was tacking a sign above his door that read "Puppies For Sale." Signs like that have a way of attracting small children and sure enough, a little boy appeared under the store owner's sign. "How much are you going to sell the puppies for?" he asked. The store owner replied, "Anywhere from $30 to $50." The little boy reached in his pocket and pulled out some change. The store owner smiled and whistled and out of the kennel came Lady, who ran down the aisle of his store followed by five teeny, tiny balls of fur. One puppy was lagging considerably behind. 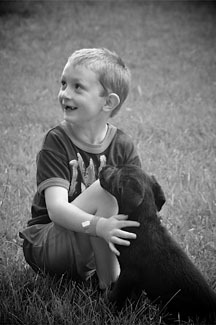 Immediately the little boy singled out the lagging, limping puppy and said, "What's wrong with that little dog?" The store owner explained that the veterinarian had examined the little puppy and had discovered it didn't have a hip socket. It would always limp. It would always be lame. The little boy became excited. "That is the little puppy that I want to buy." The store owner said, "No, you don't want to buy that little dog. If you really want him, I'll just give him to you." The little boy got quite upset. He looked straight into the store owner's eyes, pointing his finger, and said, "I don't want you to give him to me. That little dog is worth every bit as much as all the other dogs and I'll pay full price. In fact, I'll give you $2.37 now, and 50 cents a month until I have him paid for." The store owner countered, "You really don't want to buy this little dog. He is never going to be able to run and play with you like the other puppies."